Located a short distance west of the Scottish capital, Edinburgh Airport is the main airport for access to eastern Scotland. Our Edinburgh Airport guide includes contact details as well as information regarding terminal facilities, public transportation and nearby accommodation. The combined airport information and VisitScotland tourist information desk is located next to International Arrivals (tel: +44 131 4733 690). Edinburgh Airport is located just off the westbound A8 from the centre of Edinburgh. The well-signposted access road turns north off the A8 between the Gogar and Newbridge roundabouts. The total drive time to the airport from central Edinburgh is approximately 25 minutes. Edinburgh Airport is situated 12km (8 miles) west of Edinburgh. Bus:The Airlink 100 (tel: +44 131 555 6363; www.flybybus.com) express service operates daily (from 0400 to 0015) from outside the domestic arrivals area to the central Edinburgh Waverley Bridge terminus (journey time: 25 minutes; fare: £4.50), also stopping at Edinburgh Haymarket railway station. During the night, Lothian Buses' (tel: +44 131 555 6363; www.lothianbuses.com) N22 service runs at 30-minute intervals (journey time: 28 minutes; fare: £4.50), while bus 35 links to Ocean Terminal via the city centre to Edinburgh Airport during the day (journey time: 60 minutes; fare: £1.50). Tickets are available at a kiosk outside the terminal. Coach:The Citylink (tel: +44 871 266 3333; www.citylink.co.uk) coach links Edinburgh Airport to Glasgow Airport (journey time: 60 minutes; fare: £11.40). Tickets can be purchased on board or online in advance. Taxi:Taxis are available outside the arrivals area and from the rank by the coach station. These can be pre-booked either online via the airport's website, or by calling: +44 844 448 8576. The journey time and fare varies according to time of day, although it typically takes 25 minutes and costs around £20 to the city centre. Rail: A new tram line has opened that connects the airport directly to Edinburgh city centre. Trams leave the airport approximately every 8-12 minutes and tickets can be purchased from the ticket machines at the tram halt (journey time: 35 minutes; fare: £5.50). Edinburgh Airport has ATMs and bureau de change kiosks in various locations throughout the terminal, both before and after the security checkpoint. Currency can be pre-booked for collection at the airport with International Currency Exchange (www.iceplc.com). There are places to eat throughout Edinburgh Airport, both before and after security. The food village in the departures area, which includes a pub, various cafés and a sushi bar, has the most choice. There is a choice of tax- and duty-free outlets for passengers leaving the European Union in the departures area. Other shopping options post-security include fashion boutiques, electrical stores and gift shops. A newsagent is located in the public area, on the ground floor. A lost property desk (tel: +44330 223 0893) and a left-luggage facility are situated in UK Arrivals, on the ground floor. Baggage trolleys are free to use and can be found at key areas, including the car parks. Other facilities at Edinburgh Airport include baby care areas and a prayer room. British Airways has an executive lounge equipped with telephone, fax and internet facilities. The Hilton Edinburgh Airport Hotel (tel: +44 131 519 4400; www3.hilton.com) has conference facilities for up to 300 delegates, while the Holiday Inn Express Edinburgh Airport (tel: +44 131 333 4331; www.edinburghairporthotel.co.uk) can accommodate functions for up to 12 people. Free Wi-Fi internet access is available throughout Edinburgh Airport, and there are internet desks and device charging points at various points. Postboxes are located in Arrivals and Departures. Facilities for the disabled include accessible toilets, ramps, lifts and reserved seating. There is a TDD telephone in the international arrivals area and induction loops are fitted at various points throughout the terminal. Reserved parking, wheelchair assistance and help with baggage are also available. Assistance can be pre-booked (tel: +44 844 448 8833) and passengers should advise their airline of their needs before travelling. The two short-term car parks are directly in front of the terminal building; one is a surface car park and the other a multistorey garage. The ground floor of the multistorey car park has an area for stays of up to two-hours. Payment for short-stay car parking is made at the customer service office on the ground floor, or in advance online (parking.edinburghairport.com). 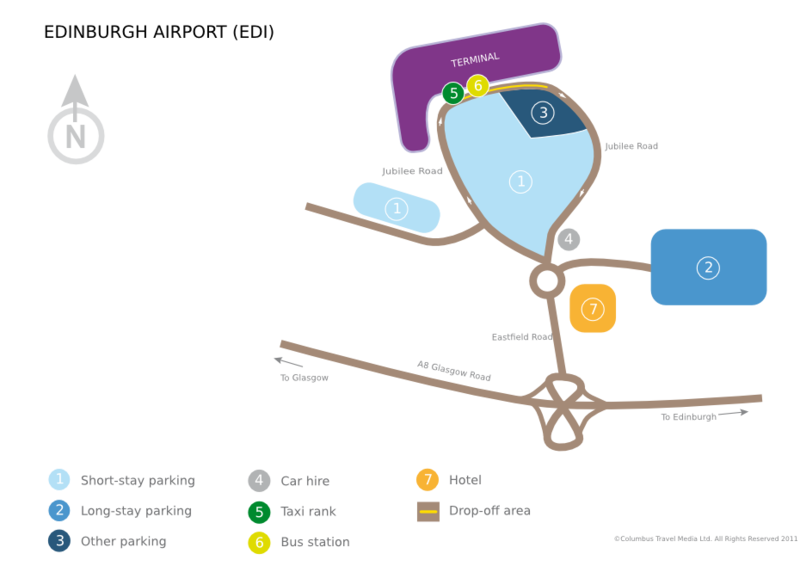 The long-term car parking area is a short distance from the airport, and is served by a free courtesy coach to the terminal. Discounts are available for pre-booked, long-term parking, which can also be made online via the airport's website. Secure, long-term parking is also available from Secure Air Parks (tel: +44 131 333 3377; www.secureairparks.com).